Synergy Tip of the Month - ..:: Region 1 > Synergy > News You Can Use ::..
What are Snapshot Views? What can they tell me? What screens can these be used on? How do I turn them on? Can I turn them on/off as needed? There are currently five Snapshot views (when turned on, and the user chooses to view them) that can give the user a brief summary of info for the screen they are interested in. The five Snapshot views are: Course, Section, Staff, Parent and Student. These Snapshot views will open where the student, staff, parent, course or section are displayed. For example, you could open all of these Snapshot views from within the Synergy Student view. When you hover over the name of a student, the Snapshot view will open and give the user the following info: Student Notifications, Student Photo, Perm Id, Marss ID, Grade, Student Email (with the ability to email the student within the view), Home Address with MapIt button, Birthdate, Age (as of today), Buttons to Email Parents and Email Teachers and, last but not least, where the student is today in school. When you hover over the name of a parent, the Snapshot view will give you the following info: Parent photo, Gender, PVUE ID, Adult ID, Last Access date into ParentVUE, Parent email (from Parent Demographics tab with email icon), Home Address, Mail Address and Work Address. When you hover the name of a staff person, the Snapshot view will give you the following info: Staff Photo, Staff E-mail (with email icon), Badge Number, Gender, Staff Type, Staff Role (check boxes for Audiology, Conference, Discipline, Health, Rater and Transportation). When you hover a section id, you will see the following info: Section Id with Course number and Course title, Teacher Name, Room number, Period, Term Code, Counts of Females, Males, Total Students, Open Seats and Teacher Aides. When you hover over a course id or course title, you will get the following info: Course Id with Course title, Department, Course Duration, Credit, Grade Range, Course Description, College Prep checkbox and Academic Type. The Student and Staff views are found in the K12 folder. The Parent view is found in the K12.ParentGuardianInfo folder. The Course view is found in the K12.CourseInfo folder. The Section view is found in the K12.ScheduleInfo folder. 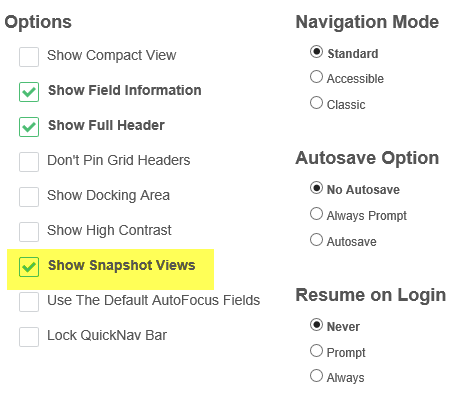 Check or uncheck the Show Snapshot Views checkbox to enable or disable these views for themselves. Give these a shot; you might find them very useful.